We’d love your help. Let us know what’s wrong with this preview of Watcher by A.J. Eversley. What if you had to choose, who would live and who would die? Sawyer Russo has sworn to protect humanity, and as a Watcher she’s done just that. But the Bots and Carbons that took her city are evolving, and they are picking the Watchers off one by one. One last rescue mission will change everything. But when someone betrays them, the line between friend and foe is no longer easily drawn. Sawyer made a vow, and she will fulfill it, even if it means ending the person who deceived them, no matter who it might be. To ask other readers questions about Watcher, please sign up. Has anyone noticed that "Watcher" is very poorly edited? There are grammatical, verb tense, spelling and usage mistakes throughout the book. A good proof-reader/editor should have caught and corrected these! Other than that, its a decent story. A.J. Eversley There were, unfortunately, many edits missed in the first edition (which I am guessing is the copy you received) and has since been fixed. I'd be…moreThere were, unfortunately, many edits missed in the first edition (which I am guessing is the copy you received) and has since been fixed. I'd be happy to send you an updated copy if you'd like! Watcher is the first book in A.J. 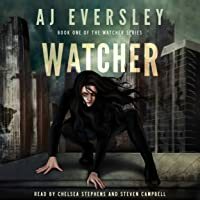 Eversley’s Watcher series, and I’m interested in seeing what book two brings. Although this wasn’t quite a full four-star rating, it was so close I had to round up. It’s one of those books that slowly works into you, slowly leaves you wanting more, until you’re sucked in so deep and cannot wait to see how everything comes together. I’ll be completely honest and say it takes a few chapters before you’re completely sucked into this one. Things start off with action Watcher is the first book in A.J. Eversley’s Watcher series, and I’m interested in seeing what book two brings. Although this wasn’t quite a full four-star rating, it was so close I had to round up. It’s one of those books that slowly works into you, slowly leaves you wanting more, until you’re sucked in so deep and cannot wait to see how everything comes together. I’ll be completely honest and say it takes a few chapters before you’re completely sucked into this one. Things start off with action – which is great – but it is a while before all the pieces of the puzzle start to come together. We had a world we do not understand, a character I did not like that much, and I was tentative for the future of the book. However, sticking with this one quickly pulls you in much deeper, and gives you so much in return. Like many young adult dystopian novels, this book is filled with action and the work of bad guys. What makes this book stand out is the different topic – usually it’s just a case of overthrowing the government because the kids are in a precarious situation, but such is not the case here. We have a clear threat to the world, a clear evil that needs to be dealt with – while human evil is part of this, there is also something more. It certainly makes this one stand out amongst the other young adult dystopian novels on the market. Of course, there are some necessities of the genre throughout this one. We have the romance, the deep friendship, the heartbreak, and a number of the other tropes – however, they are so well mixed into the story that I found myself uncaring about the occasional cliché element. I think, in part, this is because so much occurred throughout this story. From the very first page, something is happening in this one – events are non-stop, leaving you sucked in throughout. Watcher is a part of a new, exciting, YA dystopian series! This will keep the reader captivated throughout the entire book! It has non-stop adventure and action, with a slight touch of romance. If a reader enjoyed the Divergence series, then he/she will love this! How many times can one face death without succumbing to it? Can good survive evil? Is there a traitor among the humans? The "Watchers" are the few dedicated and trained ones who keep the remaining humans safe after the nuclear World War Watcher is a part of a new, exciting, YA dystopian series! This will keep the reader captivated throughout the entire book! It has non-stop adventure and action, with a slight touch of romance. If a reader enjoyed the Divergence series, then he/she will love this! The "Watchers" are the few dedicated and trained ones who keep the remaining humans safe after the nuclear World War 111 wiped out most of the nations of the earth. The Bots and Carbons are set on recruiting or destroying the remaining population of Cytos and Kuros. The ruler there has an unpenetratable element at his deposal. This tale will capture the reader's interest from the first page! The characters are very well developed and feel real. The scenes are portrayed well and easily visualized. This is written very well! The book cover is not very eye-catching but portrays the dismal situation in the book very well. The title is simple but could not better define the story content. It has a powerful and solid ending which is complete, yet, leaves the reader eager to read the next book of the series. I give this novel a strong Five Stars rating. I have read a lot of dystopian young adult books. What is most important about these types of books is the world that the story is built around and the characters. Check and check to both elements as this book had it and more. Sawyer is a strong female lead. You can't go wrong with strong female leads. Yet, she would not be where she is if it was not for the rest of the team: Adam, Kyle, Smith, and Sam to name a few. Each one was not only just as equally strong but they all had different qualiti I have read a lot of dystopian young adult books. What is most important about these types of books is the world that the story is built around and the characters. Check and check to both elements as this book had it and more. Sawyer is a strong female lead. You can't go wrong with strong female leads. Yet, she would not be where she is if it was not for the rest of the team: Adam, Kyle, Smith, and Sam to name a few. Each one was not only just as equally strong but they all had different qualities to helped the team. Than, you had the wild card, Kenzie. He shook things up a bit with the hint of flirting with Sawyer. However, the flirting was just the right amount. Not too much to take away from the overall story. Speaking of the story. What is a story without an bad guy. Coleman is the evil leader behind the Bots and Carbons. Even I did not see it coming by some of the secrets he revealed. The ending left me with a big desire to check out the next book and see how it all ends. Anyone who is a fan of dystopian, young adult books needs to grab a copy today. This is a recommended read. When I started reading the book, I was a bit wary. The reason was that this was a first time author and in general, dytopian category seemed to go a bit slow. Or rather the ones I had read in the past. But this one was a fast from the start. The only thing which had me feeling uneasy was the length of the book. It felt it was a bit long from an overview. But as soon as I started off, I didn't feel fatigued at all. It was speedy and full of action. Books are either based on the world created withi When I started reading the book, I was a bit wary. The reason was that this was a first time author and in general, dytopian category seemed to go a bit slow. Or rather the ones I had read in the past. But this one was a fast from the start. The only thing which had me feeling uneasy was the length of the book. It felt it was a bit long from an overview. But as soon as I started off, I didn't feel fatigued at all. It was speedy and full of action. Books are either based on the world created within or the characters. And there are books where both the world and the characters are equally important and are well entwined. This is one such book. The world of humans, Bots and Carbons was new to me and it was engrossing. It wasn't too technical to put me off. Actually it was easy to understand. I am happy that the author kept it intriguing with her different scientific concepts. Then there are the characters from Sawyer to Kenzie. I loved meeting all of them. Sawyer is such a strong lead. She has so much potential in her character that I can't wait to see how she forges forward in the struggle. Kenzie's introduction was a bit mysterious but he had lots of twists to add to the tale. That's another good point of the story. The author has added enough interesting turns to the tale that I was never bored. Heck no! I was very much involved in following the fascinating tale. And I have to the supporting cast. They are almost as strong as the leads and I will be remiss if I don't mention how they bolster the characters and the story. As far as I am concerned, this face paced heart pumping dystopian adventure is a real treat and I had absolute fun with the guessing of the secrets and the fast action scenes. And the romance part was small enough to add to the tale and not intervene in the plot. That was tastefully done. Now I am looking forward to Carbon !! I can't wait and I am sure that if you read this book, you will be as interested as me. I received a free copy for reviewing purposes. These are my own thoughts and they are not influenced by anything. My one line review : A fast paced dystopian action adventure! Watcher was a very compelling read. With an enigmatic protagonist and a mysterious stranger what’s not to love. I was immediately hooked on the first chapter because it had a clear introduction to the problem; bots and cyborgs! It reminds me of a Shatter Me meets Cinder in all the best ways from a strong and powerful female protagonist and well.. robots! I love Well-done sci-fi stories and this one certainly exceed my Watcher was a very compelling read. With an enigmatic protagonist and a mysterious stranger what’s not to love. I was immediately hooked on the first chapter because it had a clear introduction to the problem; bots and cyborgs! Okay so that's how we wanna play. I see. RTC! This was a very fast paced from the start, scary because it could potentially happen, apocalyptic/ SciFi story. This is definitely not a touchy-feely story at any point. It’s a brutal life, just about every character has already lost everyone they love, and they live a life knowing they could lose a friend at any minute too. This story has the extra creepy factor of how very near to our current date this timeline is, and how very possible it is that the world could turn completely upside down in This was a very fast paced from the start, scary because it could potentially happen, apocalyptic/ SciFi story. This is definitely not a touchy-feely story at any point. It’s a brutal life, just about every character has already lost everyone they love, and they live a life knowing they could lose a friend at any minute too. This story has the extra creepy factor of how very near to our current date this timeline is, and how very possible it is that the world could turn completely upside down in the exact way it happens in this story. I especially like that the author chose not to make it one big event that caused this apocalyptic world. It was one big event that started it, but then the attempted fix made things so much worse. What else have we learned in way too many stories where things go wrong? Watch out for crazy scientists that want to “make the world a better place”. We all know that no two people could ever agree on how to make the world a better place, or how to make human nature as a whole better. I suppose in a way, you could take this book as a cautionary story on this exact subject. This story is told through two different points of view. What added to much of the mystery is that you immediately know who one of the characters are, and what their part in the story is, but the other remains a mystery character for quite a while. You know their stories will combine soon, but you don’t know when, why, or if it will be a good thing or a bad thing. There is a lot that goes on in this book, and there is very rarely a slow moment. In this case, the author did a good job and making this a good thing. I never got confused about who was who, who was doing what, or what was going on where. It all flowed together very well. If anything, there may have been a few points where there was too much detail, such as a training/fight scene, where my attention did start to wander a little with the detail that went into every move each fighter made. It didn’t necessarily add to the story, and could’ve been summed up a bit quicker, but it certainly didn’t make me want to put the book down. There was never a point where the book got slow enough that I ever wanted to put it down. In fact, I never wanted to, always wanting to know what was going to happen next with each frequent development. The only confusing part of the story to me was that now that there wasn’t a “United States” anymore, and there were only 2 main cities left, it was hard to understand WHERE they were. It sounds like one is on the west coast and one is on the east coast, but at one point (and this is a potential small spoiler) they talk about WALKING from one city to the other, and it seems to be possible to be done rather quickly. Even current day, with no apocalypse and several conveniences in between, I don’t see that as being possible. It could be how I read it, but there are several things mentioned that continue to imply this, so it did get a tiny bit distracting that it wouldn’t be possible, and it wasn’t made clear where these places really were, like “formerly the California area” or “formerly the New York area”. Even with this, however, it was more of a tiny annoyance rather that affecting the story as a whole. Sawyer is the younger Watcher in her resistance that is sworn to protect humanity. It is her job to watch over the city and protect the few humans that are left. The Bots and Carbons that come out each day to try and find the last humans so they can be taken away to who knows what fate have been changing and evolving. They have now decided to target the Watcher's themselves. On a rescue mission Sawyer is faced to make a choice who lives and who dies. But something about this mission does not add up, someone has betrayed them. Sawyer made a promise to protect humanity, but that comes at a cost as she tries to figure out who is friend and who is foe and who ultimately needs to die. This was a really interesting debut novel and I really enjoyed getting to know the world and main characters that Eversley created. The world is very interesting, you can tell that Eversley used some tried and true ideas from other popular media forms, but I think that overall she was able to make them her own on most fronts by blending them together. I did not sit there reading thinking to myself oh here we go again with any of the ideas presented in this book. Additionally, I think that Eversley understood the flow that this book needed, and while it was fast paced moving from action scene to action scene, Eversley also took the time to let the reader get to know the two main characters better. I enjoy reading within the dystopia genre and some of them have been geared towards YA readers and what I really appreciate with what Eversley did within this book is to not make the book about Sawyer's romance or the need to have a guy help/save her (and also a plus in my books is that there does not seem to be a love triangle coming...finally). So this leads me to not only enjoying this book more but also liking Sawyer as a character. Though at times I found her slightly immature in her thinking process or her actions outside of a battle, but that was something more that would come in time and maturity which I do not expect Sawyer to have yet even though she has had to grow up in a war zone. Like I said above I was extremely happy that she was not boy obsessed and when push comes to shove she will do what needs to be done, even if that means killing someone. With this being said you can probably guess that there are some darker undertones within this book that I was not expecting as well. This book was like part Matrix part Terminator, so if either of those descriptors piqued your interest you should check this book out. This was great debut novel and I am looking forward to continuing on with the series. I am really looking forward to where Eversley takes the readers next. Sawyer is a watcher. That means that she is one of the last humans who can fight against the Bots and If your streets and the buildings around you were all empty, how would you react? It would be quite lonely, one would imagine–if you were one of the only humans left, fighting against robots fro the survival of the human species? That is a lot of pressure for one person to have. Eversley has a gripping science fiction novel that will pull readers in quickly and keep them hanging on every detail. After World War III, the few surviving humans live in a couple bases. The world as we know it is gone and most humans have been destroyed by the Bots and Carbons. Sawyer is part of a small group that has been trained to kill the Bots and Carbons. She lives in a secret location with a couple other Watchers. But the Bots and Carbons have evolved and are on the hunt for the watchers. When the secret location is attacked it is clear that there must be a traitor in their midst. But who could it be an After World War III, the few surviving humans live in a couple bases. The world as we know it is gone and most humans have been destroyed by the Bots and Carbons. Sawyer is part of a small group that has been trained to kill the Bots and Carbons. She lives in a secret location with a couple other Watchers. But the Bots and Carbons have evolved and are on the hunt for the watchers. When the secret location is attacked it is clear that there must be a traitor in their midst. But who could it be and can Sawyer make the tough decision to save the group of Watchers. Dystopian stories are one of my favorite genera so I couldn’t wait to get into this book. This is a beautifully created world that is in the deepest pits of despair. Things are going to hell and it looks like this is going to happen sooner than later. Sawyer is a strong female character that is out hunting the Bots and Carbons. She is very protective of her little family of watchers. She comes across as cold as ice but when you get to understand her you understand why. I love how you learn about each person in her group and come to love them like her. So you question Kenzie’s arrival but I came to enjoy the light romance between him and Sawyer. I loved this book. It is well written, draws you in, has lots twists and turns that keep you guessing, and will leave you rushing to get the next book in the series, Carbon. I received this book from iRead Book Tours for free. This has in no way influenced my opinion of this book. This dives straight into some good action with some nice descriptions and introduces us to the main character. It takes a little bit to get used to the world and whats going on but once you do its a good story and the characters are written well. There's obvious parallels to some other sci-fi properties such as Terminator but these are purely on the surface and the world we see here and its d I was given this free review copy audio book at my request and have voluntarily left this review. Sawyer Russo, one of the youngest Watchers feels she has to prove she can protect humanity. The question is, can she protect herself? Orphaned at an early age in a post World War III world, she and the other Watchers keep the humans safe from the Bots and the Carbons. It used to be easy to find and stop a Carbon, but they are evolving and adapting and it’s getting dangerous to assume anything. And then, the Watchers are infiltrated by someone. Friend,Foe, WTF? And the story takes twists you can never imagine. Who is who and why is it happening? Watcher was Impossible to Put Down. I typically read while waiting for the girls after school or between activities. After not finding time to begin this book after several days; I opened it one evening before bedtime planning just to start it and "get a feel" for the author's writing style. A few hours later, I was reading the last pages and putting the second book in my bag to read! The book maintains an action packed pace--and incorporates enough twists and turns (some rather sudden and unexp Watcher was Impossible to Put Down. I typically read while waiting for the girls after school or between activities. After not finding time to begin this book after several days; I opened it one evening before bedtime planning just to start it and "get a feel" for the author's writing style. A few hours later, I was reading the last pages and putting the second book in my bag to read! The book maintains an action packed pace--and incorporates enough twists and turns (some rather sudden and unexpected) that readers will find it impossible to put down. Eversley's Writing Style Creates a Perfect YA Dystopian Novel. The author launches readers directly into the story's action--and develops her characters and her futuristic world in pieces throughout the book. Readers develop an understanding of bots and carbons and of the characters and their plights over time. Even without being told immediately exactly what a bot is--readers are not left confused. Expect to receive the information needed to fill in the storyline, the setting, and the character development as it is necessary. Many times, readers will be even a little surprised by events right along with the book's characters. This style creates a novel that flows and grows--and doesn't burden impatient readers with lengthy descriptions and overly, technical, sci-fi jargon. Would I recommend Watcher? I loved Hunger Games--and enjoyed this series just as much. The author creates a very well rounded story and a host of characters to love (or hate) as she begins her series. I loved the flow of the novel, the twists, and the loose ends pulling me toward the next book. I highly recommend this book to dystopian fans--especially fans of novels with strong female leads. With a PG tone, it is an acceptable book for even most teen readers. I look forward to continuing this series and reading more from this author. I loved the heroine in Watcher. She was written with depth and had such a reality to her personality she jumped from the pages. I was hooked from page one, drawn into action and scenes of a world that (IMHO) could one day be our reality. In the future, wars have broken humanity, followed by technology bringing the survivors to their knees, or, in this case an underground bunker where they struggle to survive and fight back against the bots. Sawyer leads us through the history behind thier demise, I loved the heroine in Watcher. She was written with depth and had such a reality to her personality she jumped from the pages. I was hooked from page one, drawn into action and scenes of a world that (IMHO) could one day be our reality. In the future, wars have broken humanity, followed by technology bringing the survivors to their knees, or, in this case an underground bunker where they struggle to survive and fight back against the bots. Sawyer is an orphaned girl who lives in a world not unlike that of the Terminator movies, where machines have taken over and now roam the streets searching for the last remaining humans. She is a Watcher, a skilled tracker and eliminator. However, when the machines seem to be getting smarter, she and her crew must risk everything to discover why, and to stop it. If you like dystopian stories, than this will appeal to you. It's engaging, fast-paced, exciting, and Sawyer is a great main character. Sawyer is an orphaned girl who lives in a world not unlike that of the Terminator movies, where machines have taken over and now roam the streets searching for the last remaining humans. She is a Watcher, a skilled tracker and eliminator. However, when the machines seem to be getting smarter, she and her crew must risk everything to discover why, and to stop it. It took me a couple of chapters to get into the book as the start is mostly Sawyer going on about how fast and clever she is. She comes across as quite conceited rather than just confident, though I guess she's always had to act super-tough to fit in with the guys. However, I soon got pulled into the world and the story. It's a futuristic story where robots and Carbons have overrun the city and humans are being targeted. Kenzie is a real mystery throughout the book. He's a very interesting charac It took me a couple of chapters to get into the book as the start is mostly Sawyer going on about how fast and clever she is. She comes across as quite conceited rather than just confident, though I guess she's always had to act super-tough to fit in with the guys. However, I soon got pulled into the world and the story. It's a futuristic story where robots and Carbons have overrun the city and humans are being targeted. Kenzie is a real mystery throughout the book. He's a very interesting character who seems genuine but you can never be sure. I enjoyed the reading by 2 narrators. I think it gave a better feel for the 2 main characters. Watcher does a great job laying the ground work for this fantastic dystopian series. The story is action packed with descriptive world building and in depth characters that you can't help becoming invested in. The narration is on point with male and female narrators bringing the characters and story to life with a perfect inflection and pacing. I look forward to more in this series and from these narrators. I've just finished reading this YA novel and it kept me wanting to read more! There were twists that I didn't see coming and kept me from putting my book down for the night, continually saying 'just one more chapter and then I'll go to bed'. The author developed the characters in a way you can understand their drive to do what they do. It was a quick read and the story line was easy to follow! I would definitely recommend this book to friends and family! Can't wait for more from this author. I loved this dystopian read from the very first page. Sawyer is a very likeable and I could easily relate to her. The robotic elements were especially fascinating. The descriptiveness of the writing easily allowed me to become very immersed in the story. I really enjoyed the twists especially at the end. I look forward to reading more in this series. Overall this story is creepily realistic. Well thought out world building and premise. A few points fell flat for me, where I was thinking, okay get on with it already. But the twists made the wait worth it. Definitely worth reading if you are into post apocalyptic books. I look forward to discovering what happens next in Sawyers journey. This is definitely a new twist for me. Life after World War III. I really enjoyed this story line. Action, loyalty, and finding out who you can trust And the adventure continues. This book was fantastic, the story building was amazing, characters were awesome and plot was great. I was hooked from the first page. I can't wait to read the next book. An amazing story as always. Sawyer has sworn to protect but it’s not easy. A fast moving story to keep you intrigued. A superb fantasy book. Could to read it! The author makes the characters real and so every plot twist you feel! 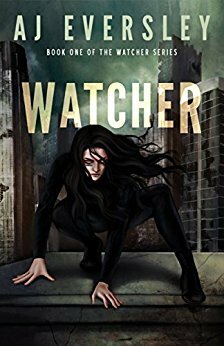 If you liked Hunger Games and Divergent, you'll LOVE Watcher. Watcher is action-packed and full of twists and turns. I felt like I was with Sawyer, seeing the destruction, the tingling in my lungs, and the pain-physical/emotional. If this book is an indication of what's to come, I can't wait to read the next one! Sawyer chose to be a Watcher in order to protect humanity, and she is one of the best in her field. She has dedicated her life to fighting Bots and Carbons, and she knows that she is probably going to die an early death. Even if she is not killed by the Bots and Carbons, if she is captured, it is her duty to kill herself so that the base isn't revealed to the enemy. She knows not to get attached to people since she will most likely end up losing them. When the Bots and Carbons star to attack her Sawyer chose to be a Watcher in order to protect humanity, and she is one of the best in her field. She has dedicated her life to fighting Bots and Carbons, and she knows that she is probably going to die an early death. Even if she is not killed by the Bots and Carbons, if she is captured, it is her duty to kill herself so that the base isn't revealed to the enemy. She knows not to get attached to people since she will most likely end up losing them. When the Bots and Carbons star to attack her group more, she is even more determined not to start relationships. Now, a traitor is in her midst and she will do anything to protect the remainders of humanity. This book does take a bit of time to really start, but once it starts, this book is nearly impossible to put down. The beginning starts and it seems like this will be almost two completely different stories, but then everything starts to come together by the middle of the book. The worldbuilding is alright in descriptions, but I could definitely visualize the action scenes and the characters themselves. I also really enjoyed the setting of the war. I got a lot of The Fifth Wave feelings from this book, which wasn't bad at all. The romance starts around 20% into the novel, and I have to say that I didn't mind it? I couldn't find a real reason why they should have been together, but they were cute together in most of their scenes. I also thought that there was going to be a triangle, but there was none! A pleasant surprise. I have now actually finished the trilogy so I can say that this was probably my favorite book in the trilogy. I would definitely recommend it to anyone looking for a new YA dystopian novel. I am the author of The Watcher Series, a YA Scifi Dystopian trilogy. I’ve always been a lover of YA books, and totally fangirl over Sarah J. Maas and Victoria Averyard. The first book in the series, aptly named WATCHER, was released March 2017. The sequel CARBON came out September 2017 and the final book in the series SAVIOR, will come out in March 2018. There are also 4 FREE Novellas that take pl I am the author of The Watcher Series, a YA Scifi Dystopian trilogy. I’ve always been a lover of YA books, and totally fangirl over Sarah J. Maas and Victoria Averyard. There are also 4 FREE Novellas that take place prior to the first book Watcher and add a little bit of incite into some key characters. Titled KENZIE, MAX, COLEMAN & AELISH. The Watcher Series is a mix of Divergent meets Terminator, so fans of either in the YA genre will love WATCHER!